Healthy Vegan Paleo Protein Ice-Cream? Strolling down Abbot Kinney Boulevard last Monday, being simultaneously ogled by tourists and studiously ignored by the uber-cool local hipsters, I suddenly heard "try our paleo vegan ice cream" waft through the air. I turned and saw a booth run by what I assumed was two college students earning extra money for books. Instead, I found two entrepreneurs, wise beyond their years. Rachel Geicke and Mariana Ferreira, who both graduated from Boston University within the last year, were handing out samples of their 'Subzero Superfood.' I tasted their two flavors - Goji Berry and Cacao - and was absolutely blown away by the delicious taste and luscious texture. The intensity of the Cacao was rich enough for a dark chocolate junkie such as myself, yet left me feeling light. Similarly, the Goji Berry was the perfect balance of tart and sweet. Subzero Superfood is creamy like ice cream but with a refreshingly all-natural superfood twist. 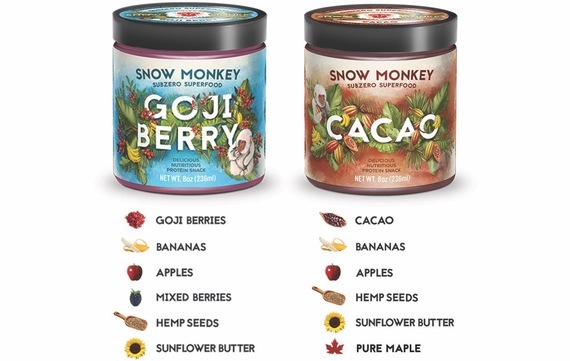 The Snow Monkey team seems to have successfully invented an ice cream alternative that anyone can eat morning or night with zero guilt. Turns out that Subzero Superfood was born in their college apartment while they were searching for a guilt-free treat to compliment their active lifestyle. After many friends begged for more, Mariana and Rachel worked on perfecting the homemade recipe and set out on a mission to revolutionize the frozen food aisle. At first, finding a manufacturer was a nightmare. Countless industry experts insisted that Rachel and Mariana's formula would break their industrial machinery and that in order to replicate the texture of ice cream they would need to add cream or fat or sugar. Mariana and Rachel remained steadfast - they would not sacrifice their goal of being vegan, paleo and protein rich - even in the face of hundreds of rejections from manufacturers and food scientists who told them it was impossible. Finally, after months of inquiries, someone didn't hang up on them. Now Rachel and Mariana are ready to bring Subzero Superfood to market. Subzero Superfood is created with a base of bananas, raw hemp seeds, apples, and sunflower butter. Then, depending on the flavor, goji berries or cacao is added. This minimalistic yet wholesome ingredient list makes Subzero Superfood paleo, vegan, dairy free, nut free, and gluten free while offering 10g of protein and loads of antioxidants. Snow Monkey takes the word "superfood" to a whole new level. It is perfect for anyone who cares about his or her mind, body, and soul - yogis, runners, swimmers, body builders, foodies, kids, and people (like me) who are counting calories. Nine months ago Subzero Superfood was an idea floating around a college dorm room. Today it is a sophisticated product, having graduated highly decorated by design agency Moxie Sozo. Currently it is selling exclusively on Kickstarter where you can buy packages of 6, 12 or 24 pods. Rachel and Mariana will use the funds raised through Kickstarter to produce the first official batches of Subzero Superfood and support their goal of securing nationwide retail. If you don't have the good fortune of bumping into these young good-doers on the street like I did, just order a pack from Kickstarter and you'll be one of the first people to taste Snow Monkey Subzero Superfood - mindful, healthy ice cream.